For the first time concerning operation "Pillar of Defense" victims, the Israeli authorities responded to the Palestinian Centre for Human Rights' (PCHR) demand and initiated an investigation in the case of targeting the photography section of al-Quds satellite channel. PCHR said in a press release Thursday that the Israeli authorities formed an investigation committee headed by Israeli General Doron Almog and the legal advisor of the Israeli Ministry of Army. On 10 February 2014, PCHR's lawyers received a request from the liaison office at Beit Hanoun (Erez) crossing that the witnesses – eight staff members from the photography section – should testify before the committee. On 11 February 2014, only six victims: Darweesh Bolbol, director of photography section; photographer Mohammed al-Akhras; photographer Khader al-Zahhar; assistant photographer Omar al-Efranji; sound technician Hussein al-Madhoun and driver Hazem al-Da'our headed to Beit Hanoun crossing to testify. Lawyers Mohammed al-Alami and Mohammed Bseiso from PCHR accompanied the victims. The case relates to the attack that took place on 18 November 2012, when Israeli warplanes fired a number of missiles at al-Quds channel's photography section in a building in Gaza City. As a result of the attack, the section was partially damaged while eight staff members inside sustained various wounds. The eight victims empowered PCHR to follow up the case. 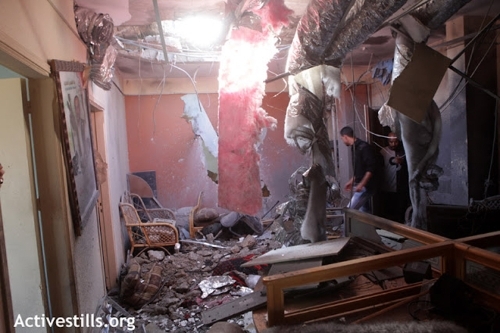 On 08 January 2013, PCHR filed a complaint to the Israeli Military Prosecutor of Operational Affairs calling for initiating a criminal investigation in the attack. On 12 May 2013, PCHR received a positive reply from the Military Prosecutor that an investigation in the attack would take place and that a committee headed by a senior officer would be formed for that purpose. It should be noted that Israeli forces launched a military offensive on the Gaza Strip (14-21 November 2012) codenamed operation "Pillar of Defense", during which hundreds of victims were killed or wounded. From the very beginning, PCHR documented the Israeli violations and crimes against Palestinian civilians, built 79 legal files and contacted the Israeli Military Prosecutor. PCHR received 24 negative replies and 2 replies on initiating investigations in 2 incidents related to targeting journalists, including journalists working at al-Quds satellite channel.